Sam Bickersteth steps down this week after more than seven years as Chief Executive of CDKN, and as PwC hands leadership of the Alliance to South African-based NGO, SouthSouthNorth. He reflects on the Alliance’s achievements and legacy. Over the past eight years, the PwC-led Climate and Development Knowledge Network (CDKN) has been a trailblazer and advocate for climate compatible development in the poorest and most vulnerable nations. Mainstreaming climate compatible development (the name given to CDKN’s e-book) has gained widespread traction since it was first proposed in 2010, and is an idea that has become central to the Sustainable Development Goals and is reflected in the Paris Agreement. This week marks an important milestone as PwC hands over CDKN to Africa based SouthSouthNorth (SSN) and the end of PwC’s leadership of this pioneering international development and climate programme. As of April 2018, the leadership of CDKN will transfer to SSN, an NGO based in Cape Town, and the CDKN Africa alliance partner. Dr Shehnaaz Moosa will take the helm as the incoming Chief Executive. CDKN has played a significant role in mainstreaming climate policies into development practices across countries as diverse as Colombia, Peru, Kenya, Rwanda, Ethiopia and Bangladesh enabling these countries to be some of the most progressive in domestic and UN convened international action on climate change. CDKN projects have helped to establish national climate change policies and plans and even legislation, as in the case of the Kenya Climate Change Bill. At subnational level, CDKN has supported over 20 cities in their adaptation plans, most notably in the historic city of Cartagena in Colombia. Projects have provided direct impacts on lives and livelihoods: notably saving lives and safeguarding health in periods of extreme heat (exacerbated by climate change). The Ahmedabad Heat Action Plan developed by CDKN effectively reduced mortality during the 2015 heatwave that hit that city and South Asia; only seven deaths were recorded in contrast to a comparable heatwave in 2010 that claimed 1300 lives. The approach has been taken up and replicated across a further 17 cities in India and Pakistan. CDKN has also been highly effective in leveraging finance for climate change and development with more than 50 instances documented. Several of these, such as Ethiopia’s successful bids to both the Green Climate Fund and Adaptation Fund, will enable national-scale resilience programmes to be implemented. Other examples include the design of a disaster risk insurance mechanism that is expected to benefit at least 250,000 people in low income communities in Pakistan, and the design of a climate resilient dam and irrigation scheme on the Limpopo River expected to provide benefits across southern Mozambique. The award-winning CDKN Negotiations Support programme played a significant role in ensuring that the voices and needs of developing countries were integrated into the Paris Climate Agreement in 2015. 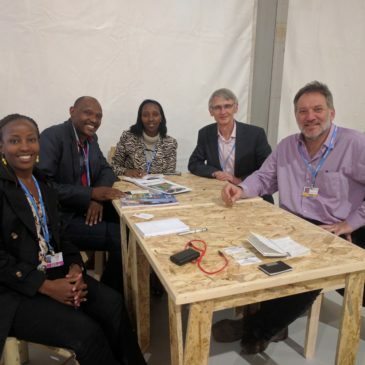 The Least Developed Countries Group, African Group of Negotiators and the High Ambition Coalition were underpinned by strategy, legal and technical support from CDKN in the years up to Paris and continue to be supported in establishing the Paris “rulebook” and further raising ambition to curb emissions and finance the necessary transition to low carbon, climate resilient development. SSN and the ongoing CDKN partnership will be building on a strong legacy. CDKN already has a significant legacy through the impacts of these and other projects and the shift in policy capability around climate change notably in the 13 deep engagement countries of the programme. By having insisted on a learning centred approach, CDKN leaves a large quantity of learning material on climate and development on its website (see for example our resources page – search ‘learning from CDKN’s experience’). CDKN has helped support networks, researchers and consultants in the global North and South who are actively promoting transitions to climate resilient, low carbon development such as the Low Emissions Development Global Partnership (LEDS GP). Perhaps its strongest legacy is in its people – of the hundreds who have worked in the CDKN Alliance team, many have gone on to pursue significant careers in climate and development organisations and continue to tackle, actively, one of the greatest challenges of our times.